“Fake news has it that we must sacrifice the NEA and the NEH for better stewardship of our national wealth and interests. It is claimed that these agencies are wasteful and unnecessary. But in fact, they are among the most important investments our society can make. By their means, we increase our chances to understand who we are, and thus to envision how we might better proceed. Their conceptual roots are in the alphabet agencies of the Great Depression when a staggering economic crisis called for a political shift in the way that the United States cared for its population, in some ways not unlike the present moment. A few hours after his inauguration, Franklin Roosevelt swore in his entire cabinet en masse, so as to hit the ground running. In the next 105 days, in the depths of the emergency, in un-ending special session, Congress created and passed the Emergency Banking Act, the Agricultural Adjustment Act, the Federal Emergency Relief Administration, the Civilian Conservation Corps, the Works Progress Administration, the Truth-in-Securities Act, the Glass-Steagall Act and the National Industrial Recovery Act. The new president was able to persuade millions that they had “nothing to fear, but fear itself.” In all, there were 15 major bills. It was a vigorous and astonishing three and a half months. The contrast with the current 100-day count-down could not be more stark. From the shocking disarray of presidential appointments to the ugly attempt of Congress to take healthcare away from millions of Americans, to the amplification of racism, Islamophobia, anti-Semitism and xenophobia, to the spate of executive orders designed precisely to undo whatever could be undone of what remains of the New Deal’s legislation and spirit, Trump’s first 100 days are the Bizarro version of the earlier period. The two-endowment agencies each receive about $148 million a year now. The budget for public broadcasting, currently $445 million, has been more consistent over the years. Together they still account for only $741 million, or much less than one-tenth of 1 percent of the United States’ annual federal spending, an amount supporters say is too small to make a difference. Proponents of preserving endowment grants are increasingly speaking of them in terms that many Republicans can love – as investments that spur job creation; as public-private partnerships that award grants that are matched by private donations; and as programs that help returning veterans or people who live in rural communities. But these defenses, though factual and earnest, and maybe even necessary, are themselves a species of “fake news.” To our adversaries, no matter how small we make ourselves, it will never be small enough. However little we claim to cost, we will still be too expensive, and however much we claim to multiply value, we will be worth too little. The premise is fake. We are aligning ourselves with the disrespect of our adversaries while attempting to gain their regard. We are fighting with one hand tied behind our backs while being shoved into a corner. It is hurtful to see. The real news makes a much larger claim: that the Federal government benefits from the CPB, the IMLS and the NEA and the NEH not because they save money but because they support another economy: that of the nation itself. This larger expenditure is in the currency of self-recognition. For calculations about the NEA and the NEH, neither the “E” (money) nor the “A” and the “H” (arts and humanities) are as important as the “N” (national). The reason to fight for the NEH and the NEA is not because we need them in order to have arts and humanities, which we will have in any case, but because we need them to know how to imagine ourselves as a nation. As in Betsy deVos’s hands the voucher system systematically aims to destroy the public schools, in Trump’s hands the destruction of the NEH and the NEA aims to voucherize the public itself. But the public cannot be supported by special interests and wealthy individuals because those are specific and exceptional rather than representative actors. During the Great Depression, under the direction of a brilliant young economist named Roy Stryker, Roosevelt’s Farm Security Administration sent more than a score of American’s most accomplished documentary photographers out into the field to take photographs that would show Americans to one another as “deserving” of government aid. This was done, if you will, under the sign of “fake news,” that is to say, the economic argument that New Deal programs of social support were saving far more than they cost. In point of fact, the enemies of the administration did not allow most of the programs to reach their full potential. No matter what the factual ratio of cost to benefit, state supported welfare was seen as creeping socialism and as something to be beaten back. But the real news is what happened anyway. 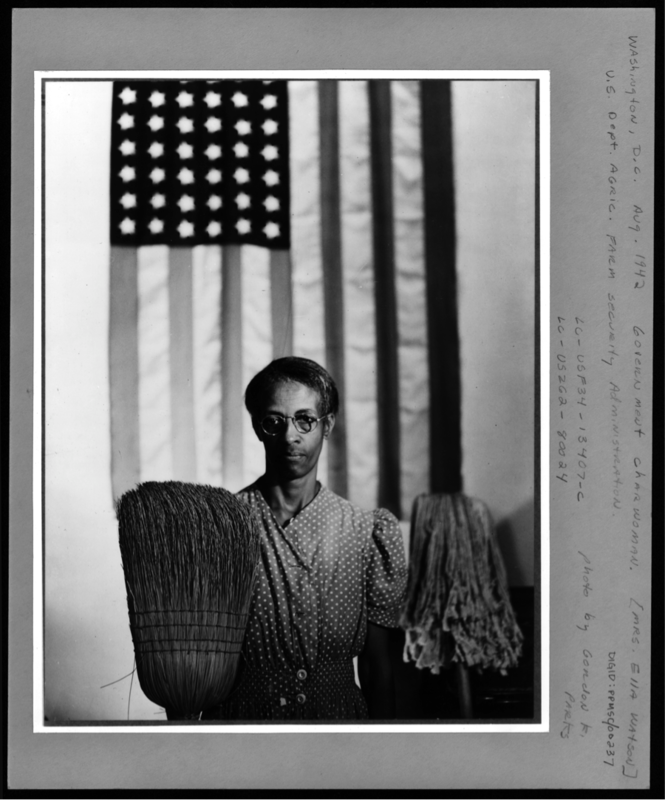 Walker Evans, Dorothea Lange, Russell Lee, Gordon Parks, Margaret Bourke-White, John Vachon, John Delano, Arthur Rothstein, Esther Bubbly, Marion Post Walcott, and many others took the opportunity to work extravagantly beyond bounds to make a collective portrait of the spirit of the American people that is unsurpassed, one of our greatest national treasures. I am Principal Investigator of the NEH-supported Photogrammar Project, codirected by Lauren Tilton and Taylor B. Arnold. Photogrammar has made an interactive, geospatial map of the more than 170,000 photographs produced between 1935-1945 by the Farm Security Administration and its successor, the Office of War Information. Because Photogrammar makes this enormous archive of images so easily searchable, it is possible to see at scale the extraordinary extra expenditure these artists laid out in the work that they did, work that had no need to be as fine as they made it. Most of the images were circulated in newsprint-quality reproductions or in government reports. Much less effort would have sufficed. And yet, the government got more. My friend and colleague, Laura Wexler and I had the opportunity to present the DOCC at the EduTech Horizons workshop held at the National University of Singapore for members of the International Association of Research Universities (IARU) of which Laura’s school, Yale, is a member. We were in friendly, interesting, and interested territory even as we presented the project to technologists who weren’t necessarily feminists, and to a truly international crowd with representatives from a significant number of continents and disciplines. Given that internationalization and feminist education are both core values of FemTechNet, it was gratifying to see the enthusiasm in this diverse audience. I knew we were at home when in his opening address, Professor Lakshminarayanan Samavedham from NUS’ Centre for Teaching and Learning reminded us to think beyond efficiency towards effectiveness in digitally-enhanced education, explaining that by this he meant experiences that were built to be engaging, personalized and authentic, just like the DOCC … (Professor John Traxler, from England’s University of Wolverhampton, a specialist on mobile computing and education, suggested we all stop using the term “technologically-enhanced” and instead dub those efforts not up to speed on technology as “technologically-deficient learning.”) Given this start, Laura and I felt fully supported to share the passionate, active, distributed, technofeminist, co-production of knowledge at the heart and daily practice of the DOCC. We felt like we had more to add to the conversation when Lynne O’Brien, Associate Vice-Provost of Digital and Online Education Initiatives at Duke, warned against digital efforts that simply replicated older forms and formats of teaching, concluding that “the faculty of the future needs to know more about learning.” This seemed a both prescient and somehow curious call, given that the powerhouse Universities assembled at the meeting are best known for (and have joined together) because of their awesome capacities at Research. Dr. Abelardo Pardo Sanchez from the University of Sydney, a powerful researcher in his own right, had a great deal to teach us about how the quickly developing field of learning analytics might be of use not just for higher education writ large (built as it is from big data) and its developing cultures of tabulation but also for understanding, optimizing, and enhancing instructors’ knowledge about what happens in their own classrooms. FemTechNet understands that technologies are complex systems with divergent values and cultural assumptions. We work to expand critical literacies about the social and political implications of these systems. 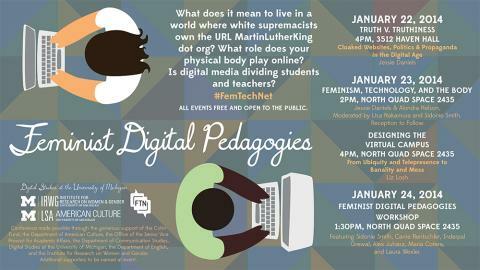 FemTechNet is cyberfeminist praxis: we recognize digital and other technologies can both subvert and reinscribe oppressive relations of power and we work to make these complex relations of power transparent. FemTechNet is hard at work creating better tools. FemTechNet has no observers, only participants. Accountability is a feminist technology. 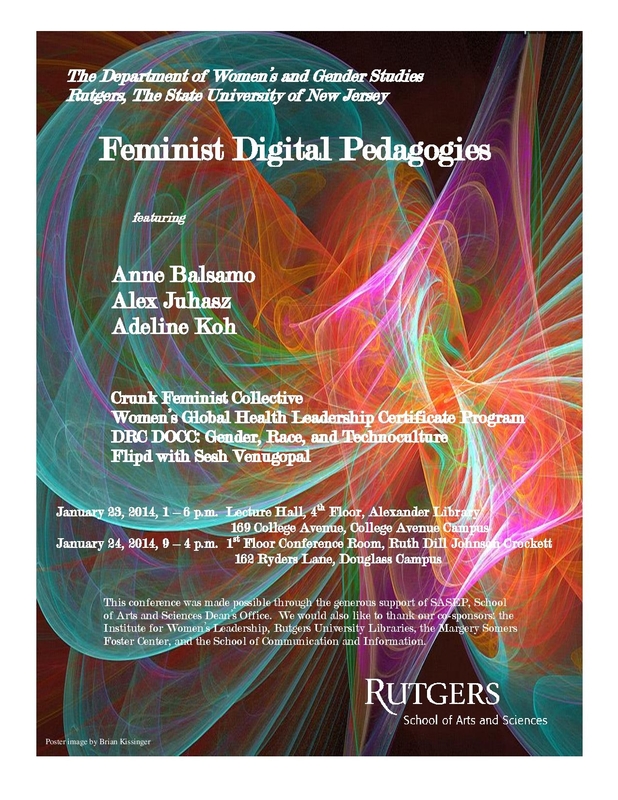 Collaboration is a feminist technology. Collectivity is a feminist technology. Care is a feminist technology. because, of course, we have long known we had to perform our feminist praxis in sites in and out of the academy, in multiple formats and to different audiences. And now we might all agree that a new part of our feminist digital pedagogy is also to divvy up the temporal spectrum, and each take some responsibility to hold down the short or medium and even, yes, long form, making sure we are present in the immediate, gratifying flows of Twitter as well as guaranteeing that we are lying safe for the long run on paper in a library. Crank (or should I say crunk) it back a day, and move the (my) body to Rutgers, and similar conversations were happening, under the same title, only in a different room, and to a similar but unique crowd (online and off: see Adeline Koh’s Storify version). Now, you might ask, why two conferences, two cities, three days? What is this telling us about this metronome and its unique piano-home? A conference, as you all know, is a kind of medium speed but fully-placed venture: long talks, all day in one room, some need for a coffee and pee break, but the sustaining, necessary gratification of f2f: we must be present to each other … sometimes. As was true just a year or two ago, when the fembot collective and the femtechnet one found ourselves forming in distinct places, for varied (feminist, digital) ends, but at the same time, and then worked together to divvy up some of that HUGE map-of-affective-labor, this current synchronicity marks a pulse we can all be nourished and energized by across our differences. Rutgers and Michigan held these sister conferences because they want to up their digital games. That’s because over just the past few years a large enough number of us have organized in a lot of places, temporalities, and forms, so as to create visibility, community, and output, so as to make it crystal clear what was always true: that there’s a new and old game in many time-frames and in a world of places; miss it to your own loss. While teaching at Peking University, she asked her students the verboden: would they share their family photos with her. It seems within the intellectual context she produced they were happy to oblige: exposing the usually hidden shape, class, possessions and other details of their private lives. However, Wexler learned that her students could only share photo albums of their own lives, as their parent’s (and grandparent’s) albums had been expunged, for fear of retaliation regarding the politics of personal life during the cultural revolution. She shared her findings about the “staging of inaccessibility” in places like contemporary China where forgetting is what sustains people (in part, Wexler thinks, because of the absence of a human right’s discourse to create a framework for remembering). She learned that continuous telling, and continuity between telling, is often the function of our (ever growing and easily sharable archive of) home images of self and family. It was painful and perplexing to think about the gaps between (visuality of) Chinese generations (also being discussed this week around different generations of Germans ), but I’ve been thinking about such gaps myself (ones that actually occur outside of systems of the state sanctioning of ongoing forgetting and within a society where human rights discourse prevails), in relation to gaps across feminist generations, as well as my father’s forced forgetting and remembering of his own Holocaust trauma. Along this vein, it was truly interesting to learn that while (after twenty-five years! ), neither of remembered the other’s face, the other’s voice, intellect, and shared feminist ethos were as vivid as they had been in the 1980s, photos to record or no.